By Jason Romesburg D.O., and Michael E. Zapadka, D.O. A 58-year-old woman underwent a noncontrast head CT after trauma. Past medical history was non-contributory. An incidental finding is discovered (Fig. 1) and further evaluated by MRI (Fig. 2). 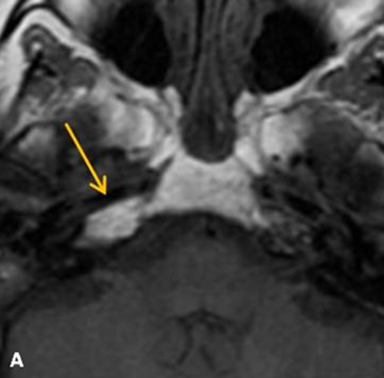 The differential diagnosis for petrous apex lesions is broad, but careful attention to certain imaging features can often help distinguish between the various entities. The radiologist plays a key role in the evaluation of lesions of the petrous apex, since this area is beyond direct inspection by the clinician and surgical access is difficult. Therefore, the radiologist’s role should go beyond detection, localization, and characterization and make every effort to arrive at the most specific diagnosis — when possible – to appropriately direct patient care. When evaluating petrous apex lesions, imaging findings are often nonspecific by CT or MRI alone. However, CT and MRI are complementary and both studies are typically required for more definitive characterization. On CT, the osteolytic component and margins are better evaluated. If the margins are smooth and scalloped, this suggests a slow-growing benign process with pressure erosion or remodeling of adjacent bone. This is more typical of cholesterol granuloma, meningocele, mucocele, schwannoma, and other benign lesions, while ill-defined margins or a permeative moth-eaten pattern are worrisome for aggressive neoplasm or infection. The presence of internal matrix/calcification is also an important feature to assess, and — if present — suggests a chondroid lesion such as chondrosarcoma. MR imaging, to include post-contrast sequences, is essential to narrow the differential diagnosis; it is superior to CT in assessing the lesion’s relationship to adjacent soft tissue structures. While solid lesions often require biopsy to determine appropriate treatment, if resection is necessary, and the extent of surgery, cysts may be treated with simple drainage and fistulization if proper preoperative diagnosis is made and treatment is necessary.1 Potential pitfalls to be aware of, primarily on MR imaging, are asymmetric pneumatization of the petrous apex and unilateral retention of secretions in apical air cells. With the former, there is unilateral T1 hyperintensity from marrow of non-pneumatized petrous apex (Fig. 3). Fat suppression techniques can usually resolve this issue, as this area will follow suppression of marrow signal elsewhere. In the latter instance, unilateral T2 hyperintensity is seen in the petrous apex from retained secretions, which is usually T1 hypointense, similar to sinus secretions. CT imaging in both of these circumstances will show absence of an expansile lesion or bony erosion, and therefore usually resolves the question. Petrous apex lesions are often incidentally seen and usually attain considerable size before causing cranial nerve symptoms that lead to their clinical presentation.1 Most of the lesions that may be encountered in clinical practice are specifically discussed below. Cholesterol granuloma (also known as cholesterol cyst or giant cholesterol cyst) is the most common primary petrous apex lesion.1 A theorized mechanism for its development is obstruction of ventilation outlet by thickened mucosa, leading to repeated cycles of hemorrhage and granulomatous reaction. When gas is trapped in the pneumatized space and absorbed over time, negative pressure in the enclosed space leads to tissue edema, breakdown of blood vessels in the region, and subsequent accumulation of blood degradation products, including cholesterol.1 These lesions typically occur in young and middle-aged adults of both sexes. 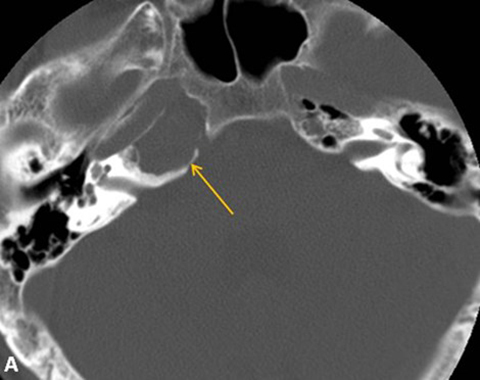 If symptomatic, hearing loss, tinnitus, and hemifacial spasm are the most common associated clinical findings.1 On CT, they are homogenous lucent expansile lesions with smooth, sharply defined margins, and no internal calcification (Fig. 4A). Overlying bone may be thinned or even absent and one may see dehiscence of the carotid canal. 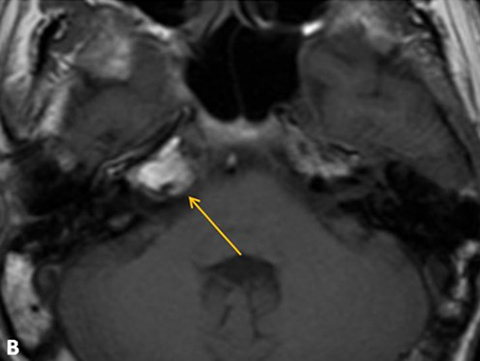 On MRI, the characteristic feature of this lesion is strong T1 hyperintensity (Fig. 4B). They are also typically bright on T2 weighted images and frequently contain non-homogenous hypointense internal areas that probably represent hemosiderin from previous hemorrhage. Note that normal unilateral T1 hyperintensity from marrow of non-pneumatized petrous apex can be a pitfall, and CT can usually sort this out if there is a question based on the MRI (Fig. 3). Epidermoid cysts contain desquamated keratin, which appears grossly as whitish friable material. For this reason, they are also referred to as primary cholesteatomas.1 As the keratin accumulates, the mass slowly enlarges. On CT, epidermoid cysts appear similar to cholesterol granulomas with a homogenous, nonenhancing, sharply defined, expansile lesion. On MR imaging, they are strongly T2 hyperintense; the presence of restricted diffusion will help differentiate these from mucoceles (see below). Although these are often referred to as “cysts,” they often contain solid or semi-solid material and are usually treated with complete surgical resection to prevent recurrence. Petrous apicitis refers to overt infection of the petrous apex, usually as a complication of otomastoiditis.3 This is thought to develop only in individuals that have a pneumatized apex, because if aerated (as is the case in approximately 30% of individuals), the petrous apex communicates with mastoid air cells and middle ear.4 On CT, there is debris and fluid in the petrous apex with destruction of bony septa (analogous to coalescent mastoiditis).4 Destruction of bony cortex can result in intracranial complications, which can be better evaluated by MRI. 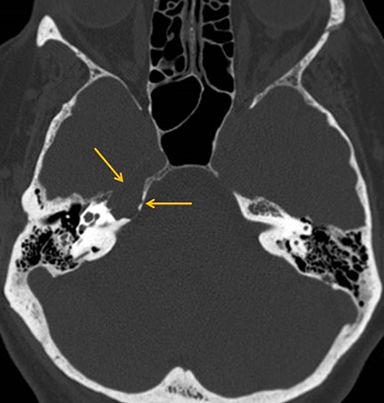 This can cause the classic Gradenigo triad of otomastoiditis, sixth nerve palsy, and pain in the distribution of the fifth nerve, although patients rarely have all of these symptoms.4 Trapped fluid, or “petrous apex effusion,” occurs commonly as an incidental finding on both CT and MRI and should not be confused with clinically significant disease. There should not be bony destruction or expansion with an effusion. Also, MRI typically shows enhancement with petrous apicitis, but that would not be the case with retained secretions. 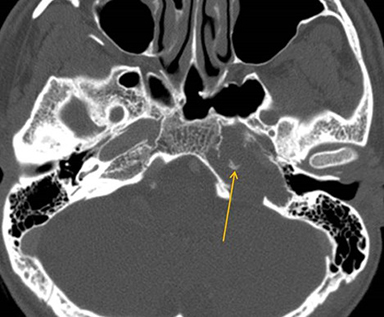 A trigeminal schwannoma may occasionally attain such size that it straddles the petrous apex, extending into the anterior and middle cranial fossae. The petrous apex may also be invaded by direct extension from nasopharyngeal squamous cell carcinoma or glomus jugulare paragangliomas. On CT, these have permeative margins and associated soft tissue components seen as enhancing masses on post- contrast imaging. Squamous cell carcinoma will be associated with an infiltrative nasopharyngeal mass. Paraganglioma will characteristically have osseous destruction with a “moth-eaten” appearance on CT; on MRI, the soft tissue mass may have a “salt and pepper” appearance. Myeloma, lymphoma, metastases, and giant cell tumors are additional tumors that may occasionally involve the petrous temporal bone and typically have aggressive imaging features. Endolymphatic sac tumors are rare papillary cystadenomatous tumors that can cause facial palsy and sensorineural hearing loss.1 These are associated with Von-Hippel-Lindau disease but may also occur sporadically; involvement tends to occur within the retrolabryrinthine petrous bone, although extension towards the apex may be seen. Petrous apex meningocele is typically an incidental finding, but is important to recognize as a potential mimicker of other lesions on CT. MRI confirms the diagnosis by demonstrating a CSF signal lesion that communicates with Meckel cave. As in this scenario, it is often possible to make a specific imaging diagnosis of a lesion involving the petrous apex. Every attempt should be made to do so, particularly because this area is not amenable to direct inspection and surgical access is difficult. Therefore, radiologists play a key role in diagnosis and determining if further management is necessary. Tsang Juliano AF, Maya MM, Lo WWM, et al. Temporal bone tumors and cerebellopontine angle lesions. In: Som PM, Curtin HD, eds. Head and Neck Imaging, 5th ed. St. Louis, MO: Mosby Inc.; 2011: 1263-1407. Moore KR, Fischbein NJ, Harnsberger HR, et al. Petrous apex cephaloceles. Am J Neuroradiol 2001; 22: 1867-1871. Chapman PR, Shah R, Cure JK, et al. Petrous Apex Lesions: Pictorial Review. Am J Roentgenol 2011; 196: WS26-WS37. 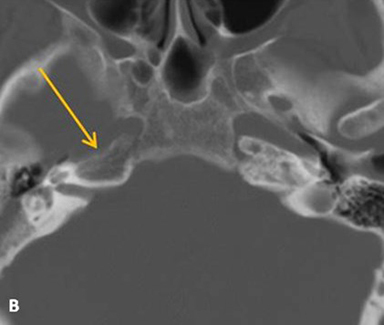 Swartz JD, Hagiwara M. Inflammatory Disease of the Temporal Bone. In: Som PM, Curtin HD, eds. Head and Neck Imaging, 5th ed. St. Louis, MO: Mosby Inc.; 2011: 1183-1229. Romesburg J, Zapadka ME. Expansile Lesion of the Petrous Apex. J Am Osteopath Coll Radiol. 2013;2(3):22-26. Jason Romesburg D.O., and Michael E. Zapadka, D.O. Dr. Romesburg and Dr. Zapadka work in the Department of Neuroradiology, Wake Forest Baptist Health, Winston-Salem, NC.